British India, Medical Congress-Bombay, 1909, silver medal, 24.17g. Obv: In centre Goddess of health, Hygeia, around legend NON EST VIVERE SED VALERE VITA. 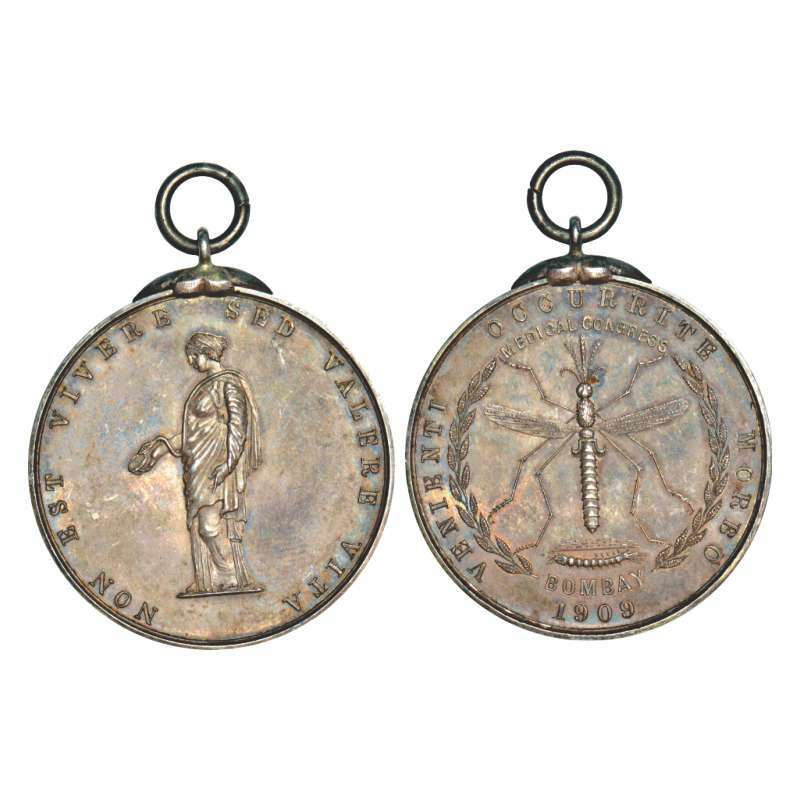 Rev: In centre a depiction of a large Mosquito; above MEDICAL CONGRESS, below BOMBAY/1909, around legend VENIENTI OCCURRI TE MORBO, Puddester 909.2. 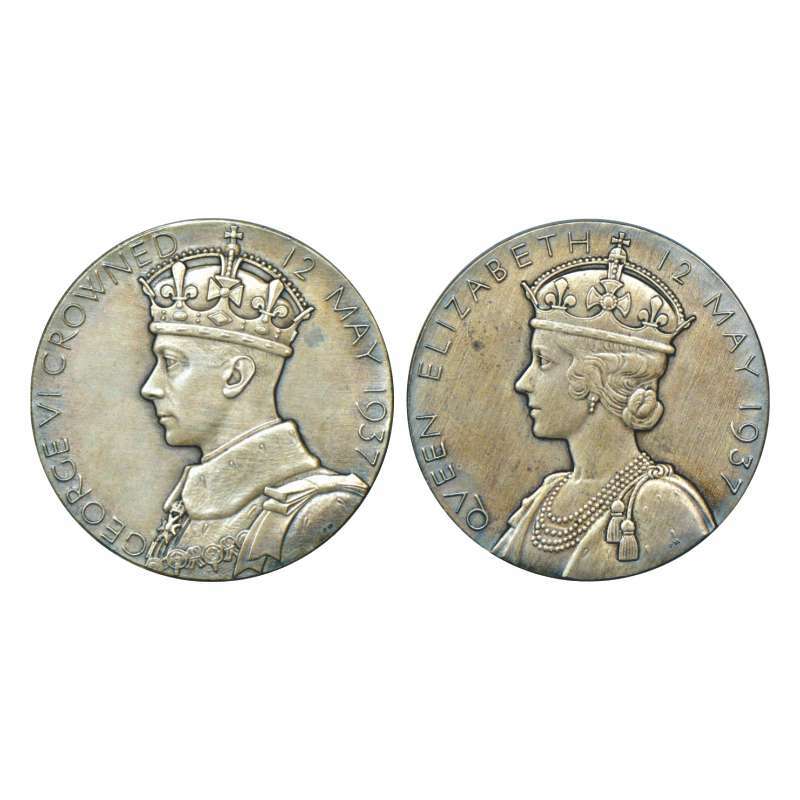 George VI, coronation, silver medal, dated 12th May 1937, 91.65g. Obv: Crowned bust of George VI. Rev: Crowned bust of Queen Elizabeth. 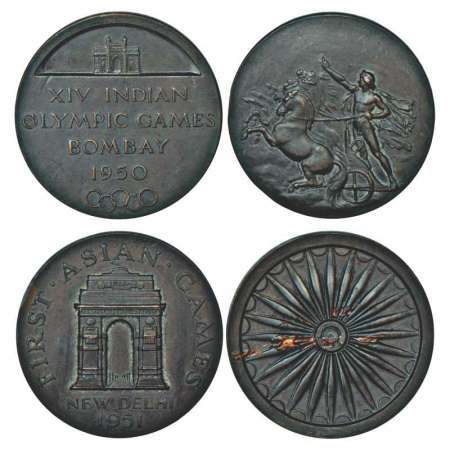 Within original mint case, Extremely fine, Rare. Nawanagar, H.H. 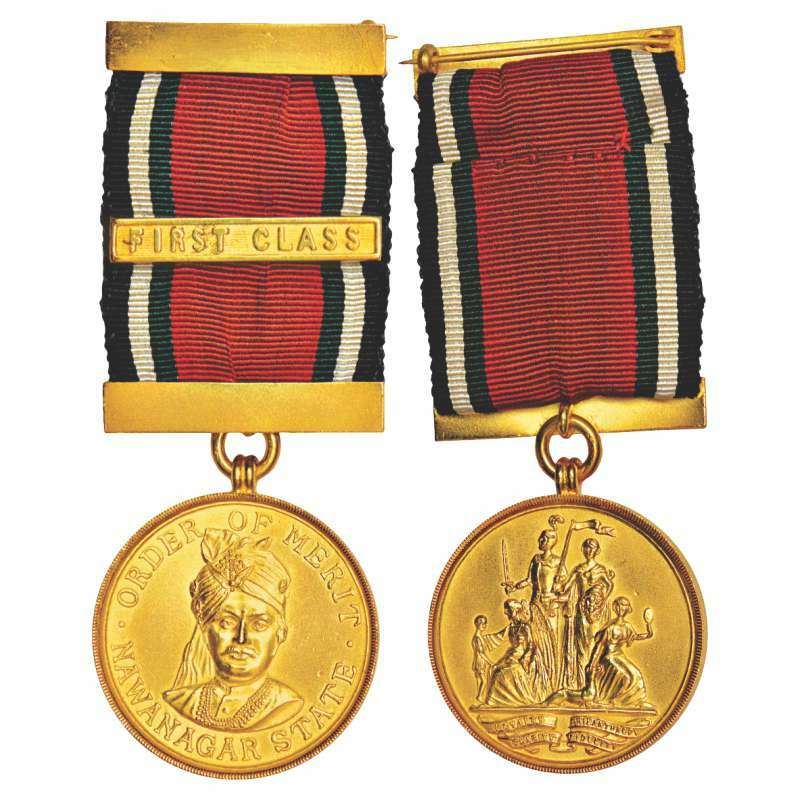 Shri Sir Ranjitsinhji Vibhaji II, Jamsaheb of Nawanagar, first class, gold medal, 28.26g. Obv: Portrait bust of Sir Ranjit Sinhji, inscription above portrait 'ORDER OF MERIT' below NAWANAGAR STATE. Rev: Two standing figure (a knight and justice) and four seated (angel with child, beauty with dog), below on four scrolls LOYALTY/PHILANTHROPY/CHARITY/FIDELITY, McClenghan 203. With suspension ring and ribbon, Extremely fine, Very rare. Rabindranath Tagore, bronze medal, 28.70g. Obv: Portrait bust of Rabindranath Tagore. 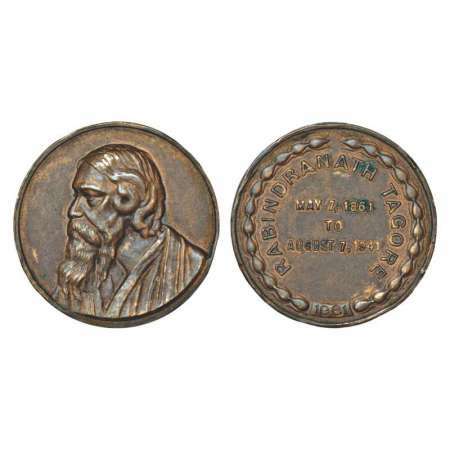 Rev: Inscription Rabindranath Tagore/May 7, 1861 to August 7, 1941. Commemorative gold medal of Mahatma Gandhi by Huguenin (currently Faude & Huguenin SA, based at La Locle, Switzerland), struck in 1948 following the killing of Gandhi, 27.83g. 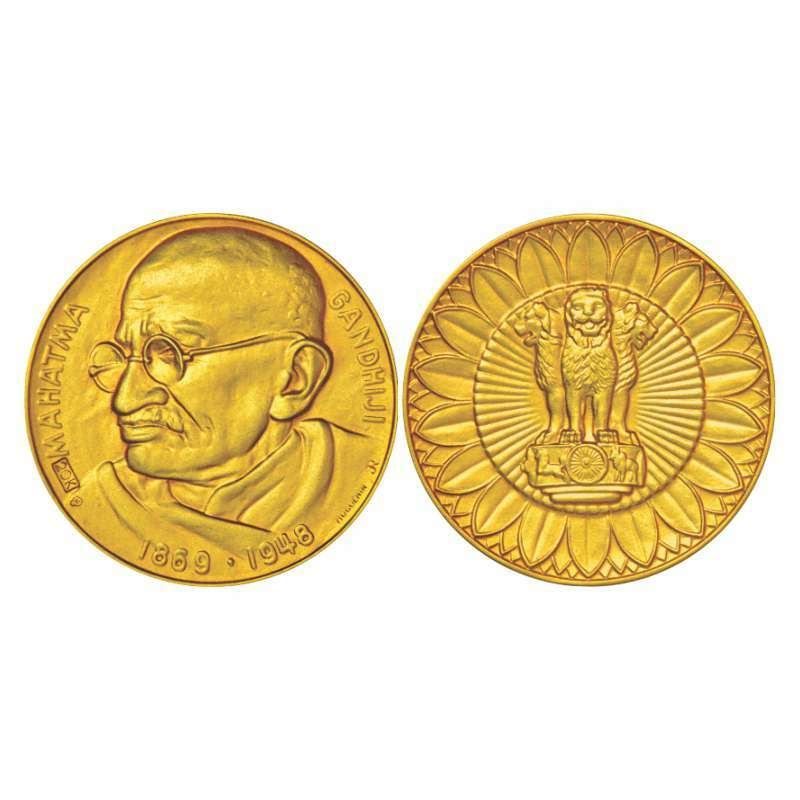 Obv: Semi-profile bust of Mahatma Gandhi, legend and maker's signature in exergue. Rev: Indian national emblem against a lotus bloom backdrop. 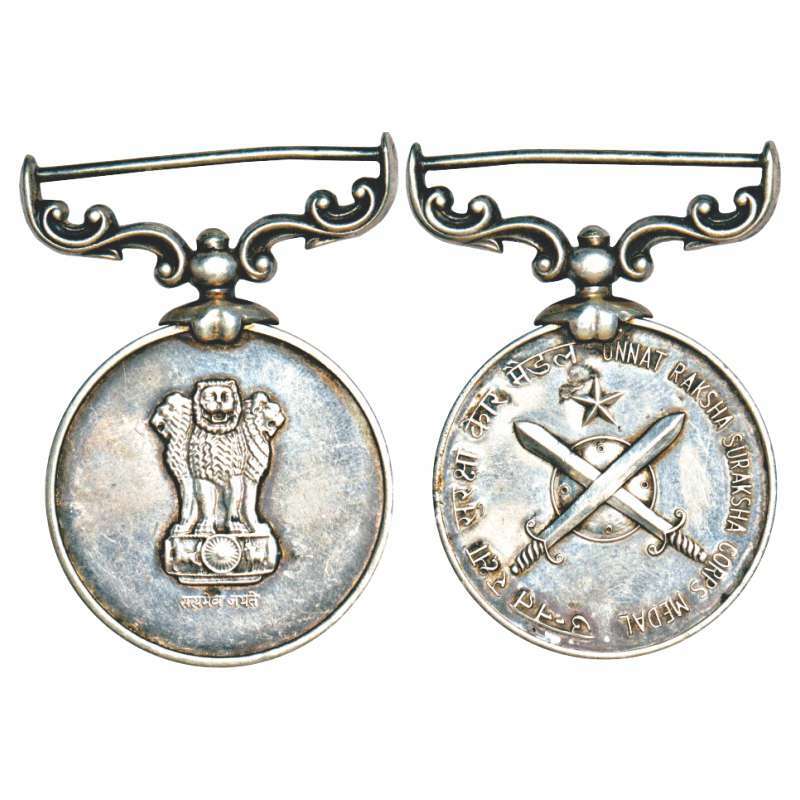 Republic of India, silver medal of Unnat Raksha Suraksha Corps, 32.28g. Obv: National emblem and motto. Rev: Two crossed swords with a five pointed star above and the Hindi and English legend, UNNAT RAKSHA SURAKSHA CORPS MEDAL, awarded to 8816630 HAV.B.B. 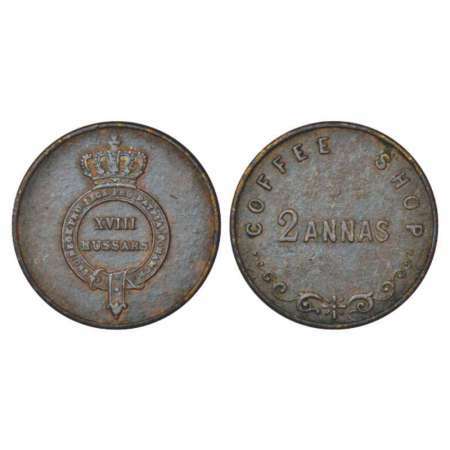 PANDEY DSC, MDI 1078.200. 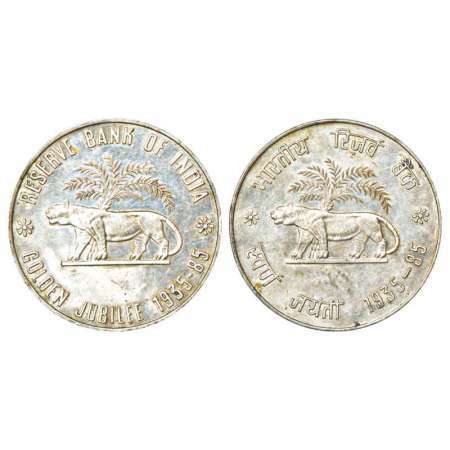 1985, Reserve Bank of India, silver medal, 35.03g. 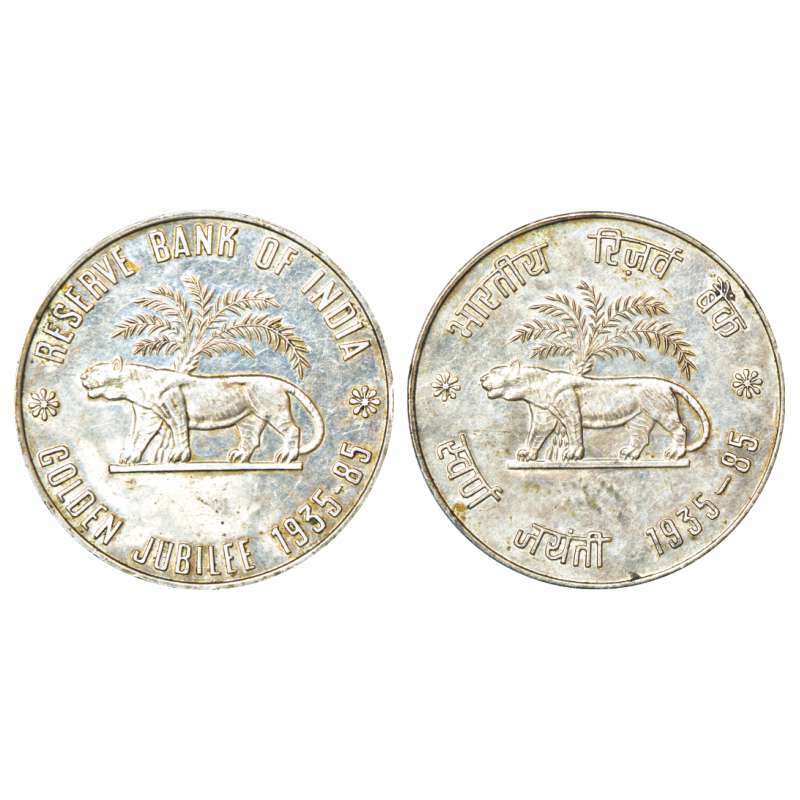 Golden Jubilee of RBI (1935-1985), logo of RBI (i.e. tiger & palm), English and devanagari legend on either sides. 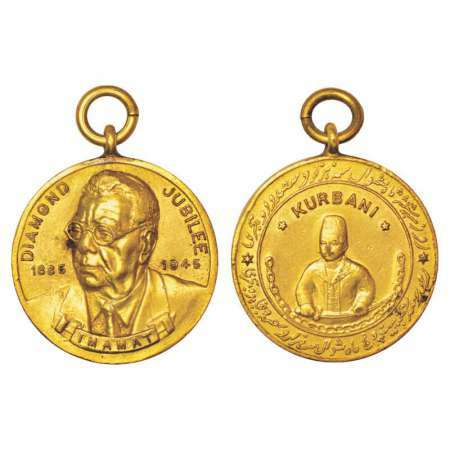 Pakistan, Aga Khan Diamond Jubilee medal, brass, 1885-1945 AD, 25.80g, portrait bust of Aga Khan on obverse and legend Kurbani on reverse. 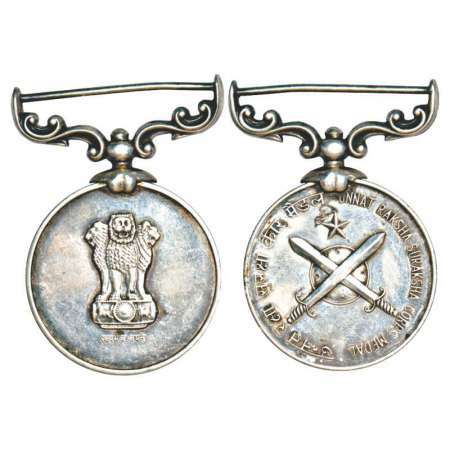 19th Hyderabad Regiment, Presidency armies in British India, silver badge, 4.95g. The Hyderabad regiment remained in service from 1922 to 1947. Regiment was established in 1922 by merger of 7 former British army units. 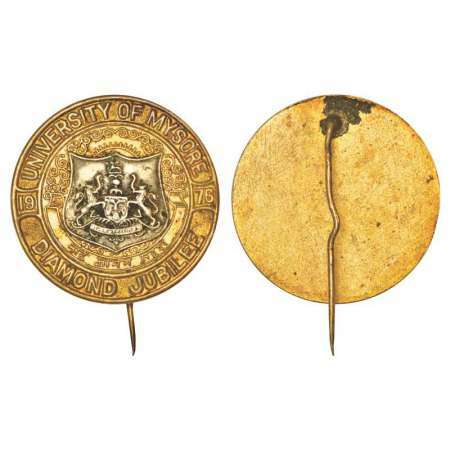 University of Mysore, Diamond Jubilee, silver and brass badge, 1976, 11.61g. Coat of arms in center with University of Mysore/Diamond Jubilee in exergue on obverse. 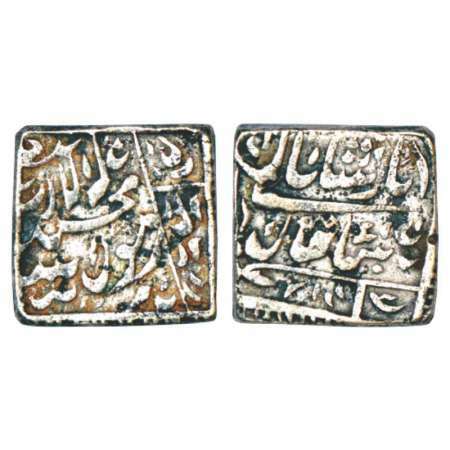 Shah Jahan (1628-1658 AD), silver square token, 11.59g. 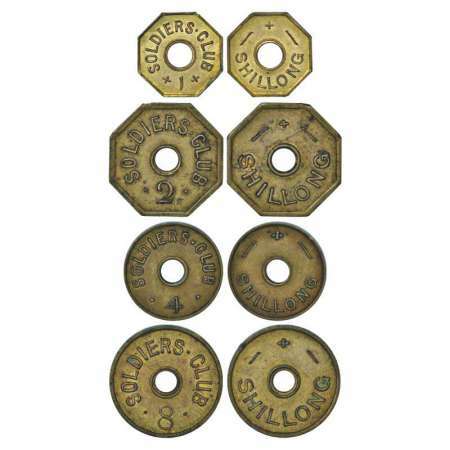 British India, Military, brass token, ND, 5.58g. 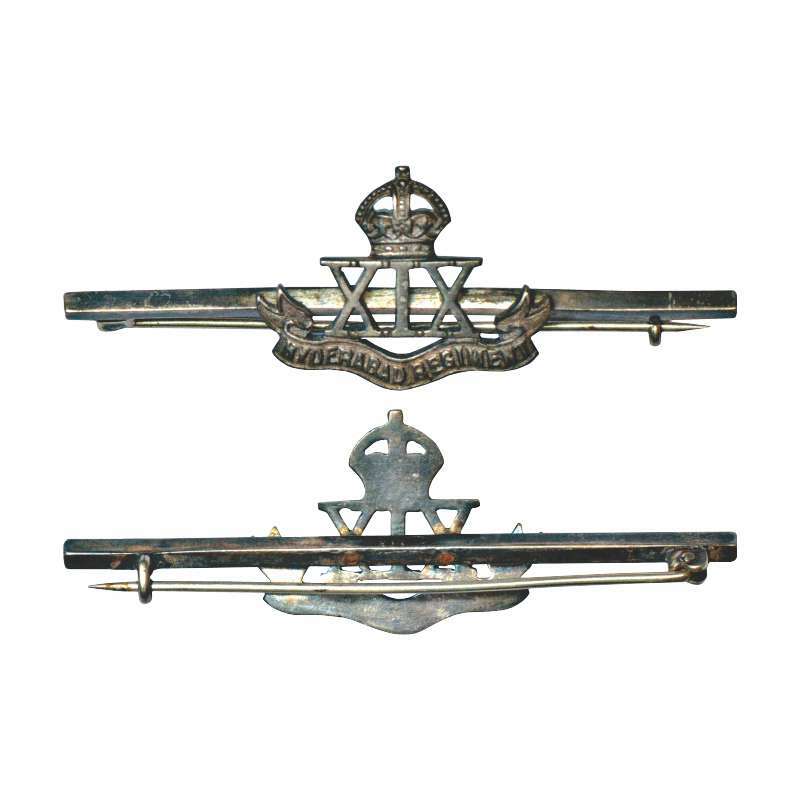 Obv: Garter, crowned and inscribed with motto PRO REGE PRO PATRIA CONAMUR within the garter XVIII HUSSARS. Rev: 2 ANNAS across the field above COFFEE SHOP, PR 210.